An offender who removed his electronic tag days before murdering a teenager has been jailed for 19 years. 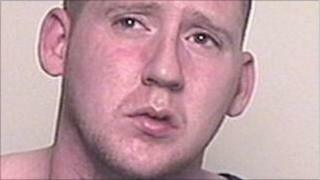 David Barker, 25, from Japp Square in Coupar Angus, stabbed Robbie Thomson 11 times after a house party, before throwing him in a burn in March 2009. An earlier trial heard the 17-year-old was still alive when he was thrown into the water. Witnesses claimed the pair had argued over cigarettes or a girl. Judge Lady Clark said Barker was guilty of a "wicked and brutal attack". She said he had shown a "complete lack of humanity" and expressed sympathy for the victim's mother, Lorraine Scofield - who has demanded an inquiry into why Barker was free to kill after he flouted an earlier court order and tore off an electronic ankle tag. An earlier trial heard how Barker and his victim had argued in a lonely spot near the Coupar Burn, between Greenburns Farm and Thorn Alley. Barker admitted killing the shopworker who had returned from Australia just a few weeks before he was killed. His plea of culpable homicide was rejected and the jury convicted him of murder. Barker had a list of previous convictions but his record did not include any serious violent offences.